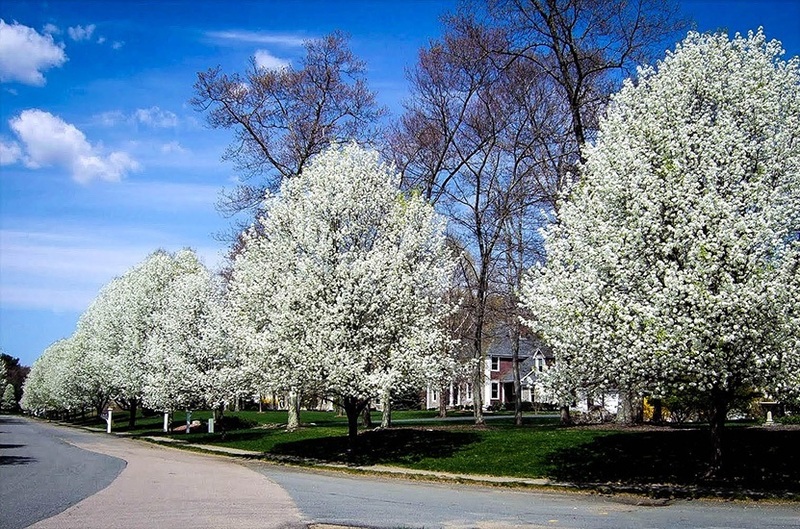 There are hundreds of ornamental trees to choose from when planting either accent trees or colorful tree rows, yet none is quite like the Cleveland Pear Tree. This stunning oval shaped tree reaches heights moderate between 30 and 40 feet tall, and its uniform shape exudes elegance with minimal effort. Many gardeners and landscapers may be familiar with the Bradford Pear Tree; the Cleveland Pear Tree is an improved cultivar. 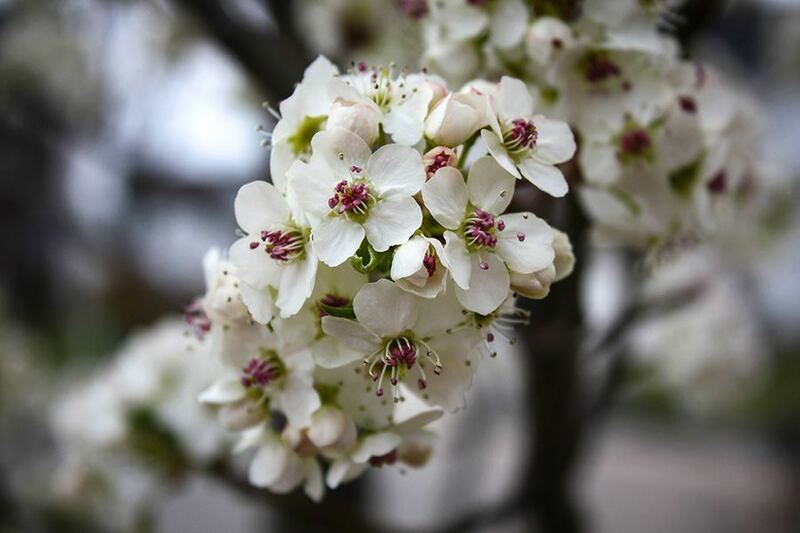 Bradford Pear Trees are notoriously weak, and these trees are easily damaged by cold weather and large spreads. The Cleveland Pear’s more compacted shape helps it to avoid these common problems. Cleveland Pear Trees are notable for a variety of reasons. One of the most noticeable factors stands out right away – the color. Pure white springtime blossoms will delight every eye passing by, while the variety of plums, brandy reds, and mellow golden yellows of autumn will also paint that season. Besides this, Cleveland Pear Trees are easy to care for once established. Not all landscapers may recommend the Cleveland Pear Tree. Although it is a beautiful ornamental tree, it does not have a long lifespan. 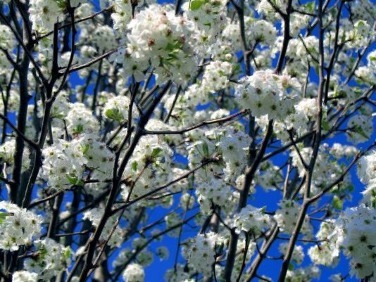 Though stronger than its cousin, the Bradford Pear Tree, the Cleveland Pear Tree is still susceptible to branch weakness due to its fast-growth. 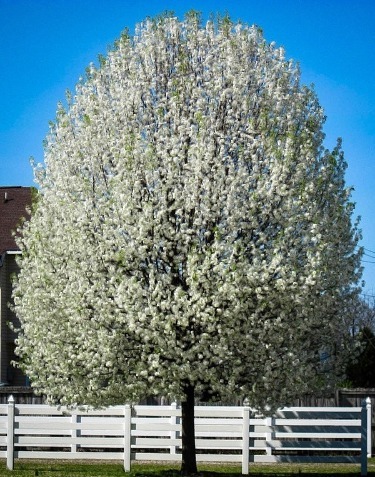 Despite these concerns, the Cleveland Pear Tree is a great choice for landscapers looking for a stunning accent tree, which coupled with fast-growth, will quickly add character to the planting location, either as an individual ornamental or lining the edges of a pathway. Sunlight – Plant in a full sun location. Cleveland Pear Trees are not tolerant of heavy shade, though minimal afternoon shade in drier locations can be helpful. Soil – Plant in well-drained, moist soil that is not overly wet. Although adaptable to many soil types, Cleveland Pear Trees prefer well-draining loam. Water – During the first season, Cleveland Pear Trees require moderate watering care, preferably once a week for 30 minutes. Once established, Cleveland Pears require little water. Pruning – Pruning is not recommended; if landscapers do feel it is required, simply remove dead branches and suckers in the fall. Cleveland Pear Trees are notably easy-to-grow, unlike many other ornamental trees, which are often quite picky. The first year is the most tentative. With proper planting and care, the Cleveland Pear Tree will quickly become well-established and requiring of minimal effort. Plant the Cleveland Pear in full sun, as the sapling and mature tree is intolerant of shade. These ornamentals can be beautiful accent trees, drawing the eye to an individual focal point in a garden landscape. 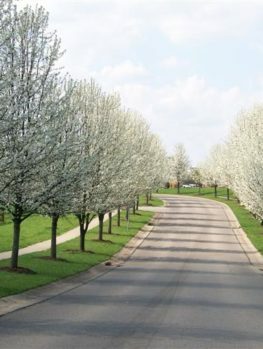 On the other hand, many landscapers choose to line entryways or driveways with rows of Cleveland Pear Trees. If you choose to plant these pear trees in rows, make sure the planting holes are about 15 feet apart, as the Cleveland Pear Tree’s mature spread will be between 15 and 20 feet. 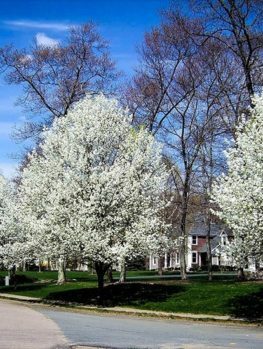 It is important to consider nearby structures when planting Cleveland Pear Trees. Avoid planting too close to buildings or underneath power lines. Cleveland Pear Trees have extensive root systems that remain close to the surface, and if planted too close to buildings, the roots may damage sewage pipes or foundations. Finally, Cleveland Pear Trees are a cultivar of the Callery pear, a species originally native to China and Vietnam. There are several other cultivars of this species, and they can cross-pollinate. If you have planted other Callery pears, such the Bradford Pear and Aristocrat, proceed cautiously with the Cleveland Pear, as these trees may hybridize after birds assist in fruit pollination. The thorny thickets produced by this hybridization can be difficult to manage. The Cleveland Pear Tree grows uniformly, so even if you choose to plant rows of these, most will grow evenly to reach between 30 and 40 feet tall and 15 and 20 feet wide. Unlike many other ornamentals, Cleveland Pears have a fast growth rate. Expect between 3 and 5 feet of new growth each season. 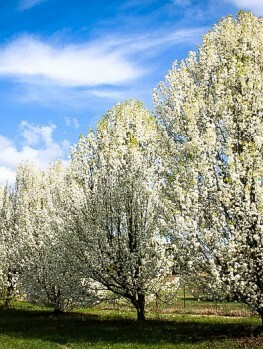 This prized quality makes the Cleveland Pear Tree a popular choice among landscapers and homeowners. Cleveland Pear Trees are not at risk for many pests. Root rot and leaf spots have been spotted on similar cultivars, though the Cleveland Select is usually immune. Additionally, the Cleveland Pear Tree is cold-hardy, surviving USDA Hardiness Zones 5 through 9, which is uncommon among other Callery pears. Breakage due to ice storms or heavy snow is the most common cause of early deaths among Cleveland Pear Trees. Finally, Callery Pear Trees do have a distinctive smell, which is not always described pleasantly. An organic chlorine smell may permeate the area, so be sure to use other lovely-smelling tree or plant varieties in nearby proximity to help cover any possible smells. The Cleveland Pear is known for its year-round enjoyment. In spring, the pear tree’s flowers blossom suddenly, covering the gray branches with thousands of small white blossoms bundled into groups on every bough. Summer brings glossy, oval shaped green leaves. The flowers may produce small fruits, no larger than an inch in diameter. These fruits are not edible. Birds will often eat and carry the seeds elsewhere, thus concerns over cross-pollination. Cleveland Pears change colors drastically in the fall, showering plum purple, burgundy, golden yellow, or fiery orange leaves based on sunlight and soil composition. – Pear Wood is prized for its fine textures. As such, it is used in woodworking and many woodwind instruments. – Callery Pear Trees are non-native invasive. This means that they do not originate in the United States, and they can damage the native ecosystem with overgrowth. Cleveland Pear Trees can still be planted, just be careful before planting near other Callery pears. 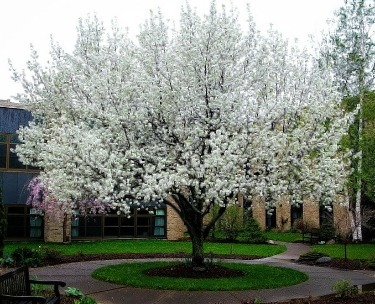 – Cleveland Pear Trees are pollutant-tolerant and immune to most diseases and pests that normally affect flowering ornamentals. – Natural-based mulches are helpful when planting Cleveland Pear Trees; simply place a 3-inch layer of mulch at the base of the Cleveland Pear. I am thinking about planting a row of Cleveland Ornamental Pear Trees along the south side of the house. there is 30ft between the house and street, if I plant them 15ft from the house and 15ft from the street. is that far enough space to prevent foundation/sewage damage? That spacing will be fine to protect both the house foundations and also the road structure and curbs. However you need to know where the sewage line is if possible, since it could be right below where you are planting. Cleveland Pear is not known for invading sewage pipes but it would be best to plant away from the line. You really only need 6 to 8 feet from the foundations or from the curb, so you have lots of space to move the row around once you know where the sewage line actually is. Your city should be able to tell you its position, or there may be manholes that show you. Good choice with the trees – they will look beautiful in bloom! Hi I have a mature tree its about 7 feet from my brick home. It is about 40 feet tall and main trunk a good foot in diameter. What would I look for if it has damaged my house foundation or drain tiles ..
That should be fine. I have 6 of them and they grow in a very predictable compact oval shape. I have some of them planted within 5 feet of a fence line with no root problems. For some reason nobody ever mentions how incredibly long they keep their green leaves. Sometimes they’ll be covered in snow before they start changing color. I have 2 Cleveland Select trees. Planted about 20 ft apart. They were both planted in 2013. They both flowered that year but only one is flowering. It flowered last year and this year but not the other. Thet get the same treatments and water. Whats going on? Ps..our town Joplin Mo has thousands of theses trees everywhere. Thry are all in bloom. I’m having the same issue. What can be done to save tree? We planted two rows of Cleveland pears this spring. Some of them have green leaves on top, some have some green on the base near the ground and others have no green at all. Is there anything recommended that we do for the ones with green near the ground? Should we cut back the base of the tree to the green? Or is it better to just leave it and let it grow? Thanks! Has the top of the tree died? Cut off any dead branches. I had a kousa dogwood mostly die. It had started to sucker at the base so I cut the trunk off almost to the ground to the top of the first sucker. Now I have a kousa dogwood with 5 trunks. It looked like it would die the first summer but grew 3 foot over the next year. My husband planted a Cleveland Pear on Mother’s Day. It has been fine until about 2 weeks ago. Now the leaves have brown holes with burnt looking edges (with no sign of pests) and are starting to curl. They look like they have been munched on. What is wrong with my tree? Help, Please! 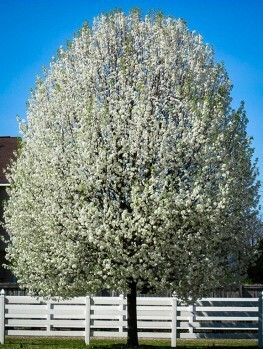 I have 2 ornamental pear trees at a home I just purchased. They are only about 8 feet from the foundation of the home. Trees are mature and around 30 feet high. Do I need to consider immediate removal of the trees due to concerns about the foundation? I would also like to know as I have on that close to my home. I have a 20 year old flowering tree, what would it cost to replace it? It is about 12-15 feet high. Thanks! Planted a Cleveland Pair in spring of 2014 as a bear root plant. Had a windy day last week (October 2015) and the tree was leaning over. We have had worse wind in the past without problems. Is something now wrong with the root system now? I did cut off a couple lower branches about two weeks before this happened. Could that have caused some issue with the tree? It appears to be very healthy and has not shed leaves yet. I nwas told these trees can tolerate wet soils. Is this true? What would you plant in zone 6 with wet soils? We planted a Cleveland pear about two years ago. It is not growing very fast. Defiantly not the 3-5 feet a year as advertised. What can I do to help it grow faster? It is mid-September and my Cleveland pear is blooming! What’s going on? Help. I planted one curbside in the city. First branches are so low, one cant get out of a car! Can I prune these? Will these trees be able to stand high temperatures ? How about high altitude? we are 8,000 ft…? I have a Cleveland pear tree I planted last year! Was wondering when will it bloom? It’s April here in Texas!! I live in Houston and have a cleveland pear tree. I noticed some saw dust around the tree’s base. What can be causing this? I really don’t want to lose the tree, It is close to 2 stories and Love it. I have a Cleveland pear that keeps producing many suckers at ground level. I have used a product called Sucker-Stopper RTU. I have been diligent but the suckers keep coming. What can I do to stop this? we have 28 cleveland pear trees on both sides of out driveway. They were planted 15 years. Now the trees on the left side of the driveway are dieing, Leaves were drooping at one point. Two arborist were not able to tell us what is wrongl the trees on the right side are not so bad, but not growing as the use to. On that side of the driveway, the grass has standing poodles near some of those trees. I don,t know if the trees are getting too much water or not enough. How does one know? In the last two weeks we have had the grass dug up about 1 to 2 inches around the trees, we have gotten all the grass around them and planted mullch to control the weeds.. I go out and pull weeds and sap suckers, and have watered them since we mulched two days ago. What else can we do, look for? I would like to plant a Cleveland pear andblive in mid Missouri. When is the best time of the year to plant one? In the summer of 2009 I moved into an apartment that had a small courtyard lawn with no trees,but the adjacent property had a large quite old tree that spread and shaded their back yard,as well as a good portion of our courtyard. I had no idea what it was. My 2nd floor living room picture window’s view was almost exclusively the leaves and branches of this tree. My first fall there I was shocked and awed to wake up and discover the dramatic changes in colors the leaves would display just as you described. I believe I counted 5-6 different color changes before losing its leaves! In 2013 I bought a house with no tree in the front yard. I returned to the old apartment, snapped a small branch from that tree and headed to the local garden center/nursery. Holding the small branch up the clerk saw it and before I could ask what it was they said out loud “Cleveland Select”. It’s been in the front yard now 5 years appears healthy with no issues. One question. Should I prune any branches that grow at less than 30 degrees or greater than 90 degrees to its trunk or host branch or just let it be? My subdivision has Cleveland Pears between sidewalk and road. The trunks on all the trees have moss surrounding them. Is this common?. Out subdivision is about 15 years old. So the trees are a couple years older. I have a Cleveland pear tree in my backyard it is three years old, last year it didn’t flower and this year there are two clusters of flowers on the tree. Is there something that I could be doing wrong? Or what else could it be that’s keeping the Cleveland pear tree from flowering? We planted a Cleveland Pear a few years ago. It’s about 15 feet tall but growing straight up, not spreading at all. It’s probably only 1 1/2 – 2 feet wide. How do we get it to spread out for shade?